"Our slim design brush with dispersed bristles grabs and captures even the shortest lashes to lengthen, extend and separate like no other. We use a unique botanical blend with key ingredient Pro-vitamin B to promote growth by preventing breakage for instantly longer lashes with long-term lash care." Here's what is worth knowing about the 'Skinny Brush' Mascara. It contains Pro-vitamin B which helps condition the lashes and is Paraben-free! I've been testing this out since I came home with it. I found it has great staying power, it doesn't budge or smudge to my lower lashline. Nor does it flake, and my lashes stayed perfectly curled in place all day long. I also love the intense black, it's extremely deep so makes lashes really stand out. 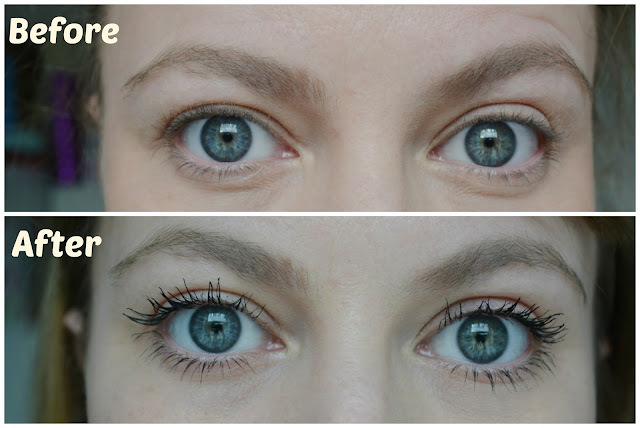 As you can see above this mascara really does work well, even on my not so fabulous lashes. I have to say I don't often buy magazines unless they come with an amazing freebie and this was no different. Is it just me or are glossy mags all full of adverts these days? Really I struggled to find anything worth reading in InStyle! I don't think the brush is right for me. But good to hear you like it!